Buubbub is a Burmese and Thai restaurant located on the northern end of Smith Street Collingwood. I used to get over this way all the time but these days I rarely dine on either Brunswick or Smith Street so I was happy for the opportunity to get back over this way again. OK so first things first, what's the deal with the name? It certainly doesn't sounds Thai and although I have no idea about the Burmese language I'm guessing it doesn't sound very Burmese either. So the deal is that Buubbub is a construct of Thai numerology which has then been converted into letters (letterology?) and you get Buubuub. And I'm told it means 'people will love our restaurant and keep coming back' or something along those lines. Owner Khun Mai tells me that she has been happy with the level of business since opening and is comfortable that the numerology based restaurant name is working as it should. The Thai can be quite superstitious (Khun Mai is Thai) and I have read they often pay large sums of money for specific 'lucky' mobile phone numbers. I also understand that the selection of lottery numbers is treated with a great deal of superstition, often specialist fortune tellers are consulted to assist in picking the winning numbers. 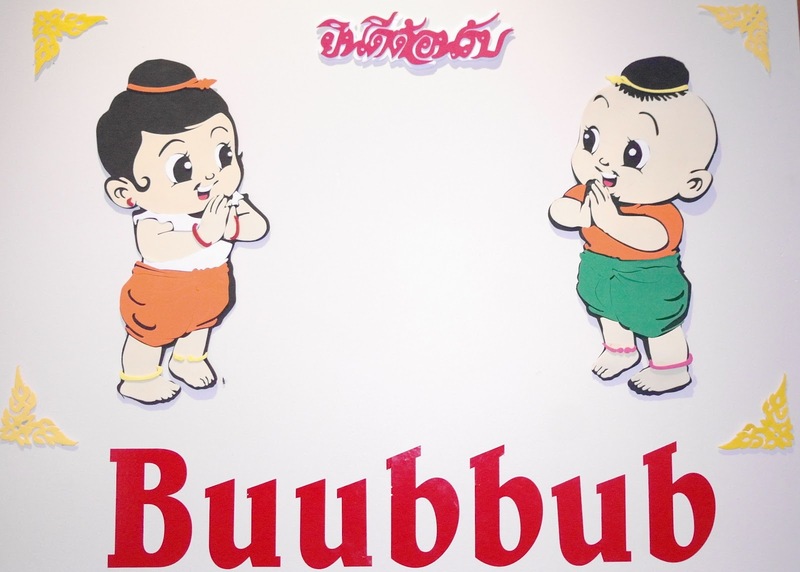 Buubbub specialises in Burmese and Thai cuisine but as I pretty much always eat Thai and have never tried Burmese I was keen to see what the Burmese food was all about. Most people will know of the recent political issues in Burma, or at least they may have heard of Aung San Suu Ky. Burma is formally referred to as Myanmar, I'm not sure that Myanmarese food rolls of the tongue quite as easily as Burmese food. 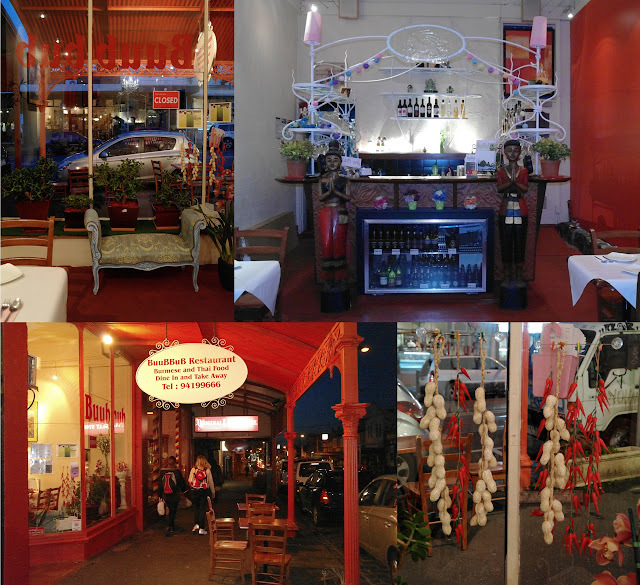 The restaurant has some of the usual traditional Thai decorations but is also prettied up with an almost vintage feel which I thought fit quite well with what most diners would expect from a Smith Street establishment. 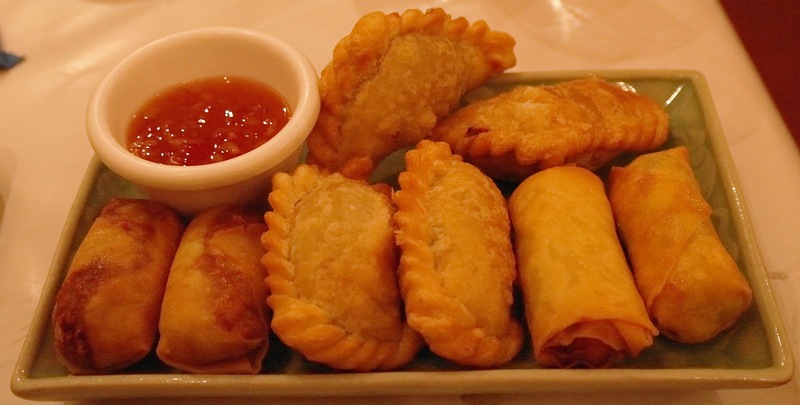 We started with a pretty standard array of entrees, curry puffs, chicken satays and spring rolls. I didn't ask but I got the feeling that these were all made in house as the fillings didn't seem like the usual pre-made kind. The chicken spring rolls were full of delicious minced chicken and not just a smattering of mince filled out with cabbage as is often the case. Same goes for the vegetable curry puffs and spring rolls, all were chock full of vegetables including peas, corn and even potato and no cabbage in sight. I don't mind a bit of cabbage in my deep fried entrees but something different makes a nice change. It's also worth mentioning that they were all cooked quite well with no trace of excess oiliness that is the telltale sign of poorly executed deep frying. 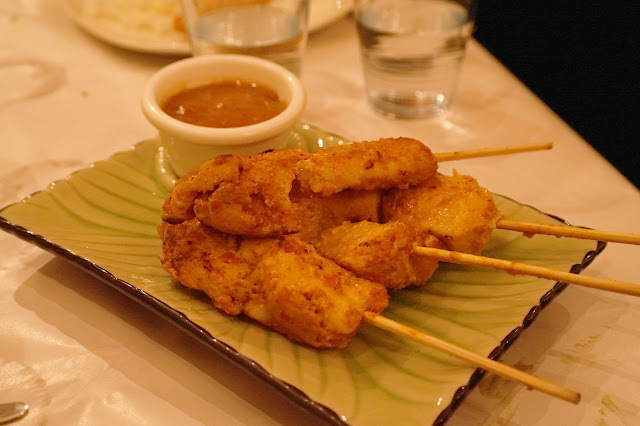 The chicken satays were excellent, a great dipping sauce that was a lovely and peanutty and the chicken was beautifully tender. None of these entrees are things that I get too excited about as they are pretty standard but I definitely enjoyed them all. I don't often order spring rolls and satays these days but I do think these kinds of simple menu items are often a good test of a restaurant. You can tell a lot about how these simple items are prepared. Buubbub easily passed my entree test. Now onto the mains. 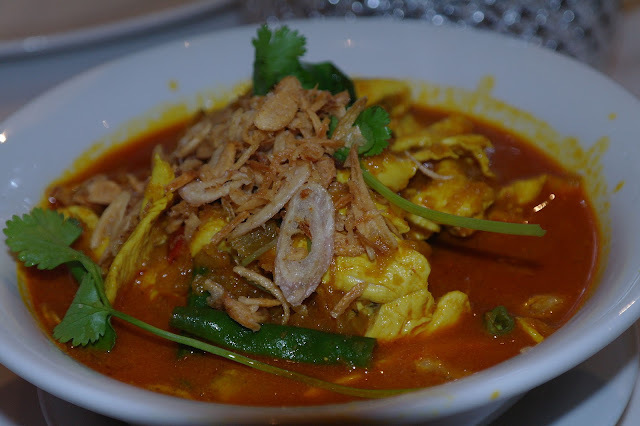 The first dish to arrive was the Burmese Tamarind Chicken Curry. This style of curry is different from most Thai curries in that it isn't thickened with coconut milk or cream and therefore has a much thinner ligher consistency It actually reminded me of the Thai 'Gaeng Som' sour curry. The use of water or stock as a base for curry usually indicates an inland origin where coconuts are not available. The flavour is also markedly different to the coconut curries with the sourness of the tamarind the predominant flavour. This isn't to everyones taste but is certainly worth trying if you get the chance. Unlike Gaeng Som this curry wasn't particularly spicy although I'm not sure whether this is traditional or an adjustment to cater for Buubbub's mostly western clientele. Another differentiating factor was the use of a lot of fresh vegetables including tender eggplant and crunchy green beans. Any lack of coconut creaminess in the previous dish was certainly more than compensated for by the Fish Cake Curry. 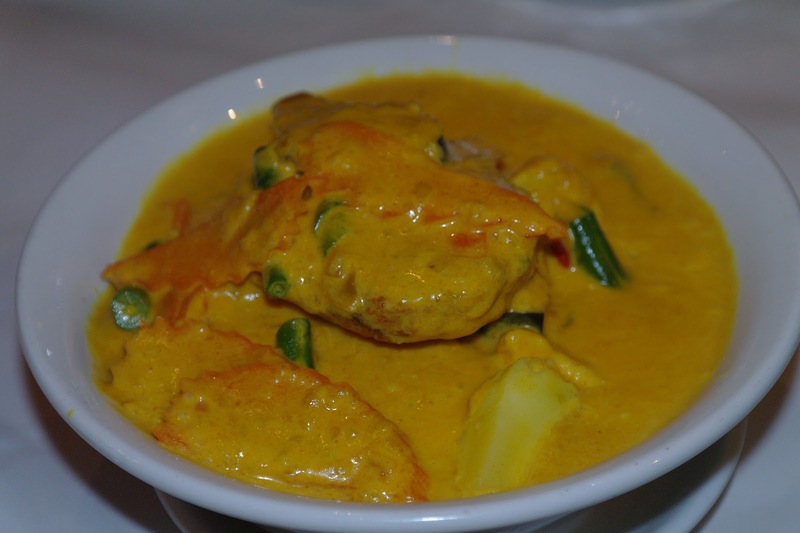 This dish was very creamy with coconut milk and quite heavy and thick in consistency. Khun Mai informed me that they use Kara coconut milk which is also my choice when cooking at home however while it's far superior to any canned option it is quite thick and in my opinion is often best thinned out with some water. Still, the thickness of the curry didn't detract from the flavour which again wasn't overly spicy or sweet. A nice change from a lot of the Thai curries served up in Melbourne. Interestingly this curry uses fish cakes as the protein, something I hadn't seen before and quite liked. Although the large fish cakes make serving a bit awkward they add a lovely springy texture to the dish. The last dish was easily my favourite. The Eggplant Salad was quite interesting as once again it was quite unlike anything I'd tried previously. I am so used to seeing Thai salads like this presented beautifully with lots of lovely textural elements and on sampling my first mouthful was quite surprised by the flavour. I was prepared to be hit with that wonderful combination of spice, sourness and sweetnees and was definitely not expecting the flavour of smoky grilled eggplant that I experienced. It's certainly not something that I associate with south east asia but I liked it! I had to keep tasting it just to be sure how I felt about it, it's strange how your expectations on seeing a dish can preposition your taste expectations. As with all the meals I ate at Buubbub I really can't comment on the authenticity of this dish but that's probably irrelevant anyway. It really should be all about taste and on that measure Buubbub passed with flying colours. This review was conducted in my capacity as restaurant reviewer for ‘Thailiciouz’. I dined as a guest of the restaurant who knew in advance that I would be dining there, and selected the dishes they wanted to showcase. 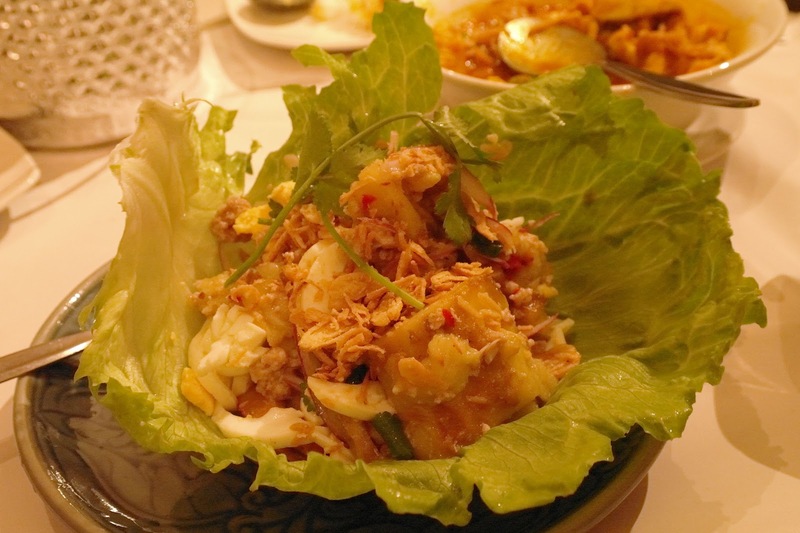 This review is reproduced on www.thailiciouz.com.au Please visit the ‘Thailiciouz’ website for information on how you can receive hot deals from various Thai eateries, massage parlours and other contemporary Thai businesses. However, if you really want to study this ancient practice seriously, you need to choose the right source of learning. You have to know where you will get the perfect help for your queries while learning numerology.